CM: Ioannis Metaxas (1871-1941) was a Greek General, leader of the 'Komma ton Eleftherofronon' (Liberals Party) and Prime Minister of Greece from 1936 until his death in 1941. Born in Ithaca on 12 April 1871, he graduated with top grades in the class of 1879. As second lieutenant of engineers he took part in the war against the Turks in 1897 the headquarters of Crown Prince Constantine. He furthered his studies with honors in the Berlin Academy of War (1899-1903), and after offering his services in modernizing the Greek army (1903-1910), was selected in 1910 by Eleftherios Venizelos as the first flag lieutenant, adviser to the military. He signed military agreements with Bulgaria and Serbia, before 1912 and as a member of the headquarters of Crown Prince Constantine planned most battles during the Balkan Wars (1912-1913). He signed protocols for delivery of the Turks in Thessaloniki and Ioannina, on behalf of Commander in Chief Crown Prince Constantine. He became Chief of General Headquarters of the Army, and in 1915, when he clashed with Venizelos on military matters, he asked to be demobilized. He supported King Constantine and objected to the involvement of Greece in the Dardanelles campaign, the First World War, and the Asia Minor campaign, resulting into exile with his family in Corsica as a prisoner of the French allies (1917-1920). He escaped and remained in custody in Sardinia (1918-1919), Siena and Florence (1919-1920). He was sentenced in absentia to death and returned to Greece in 1920 when Venizelos lost the elections. He engaged in politics from 1923-1936 as Deputy of Cephalonia. He became Minister of Transport offering great service to the Zaimis Government. He founded the 'Komma ton Eleftherofronon' (Liberals Party) and associated politically with the republic regime from 1923 to 1936, a period during which Greece saw 32 governmental movements, revolutions and dictatorships. In the Zaimis government 4/12/1926-8/2/1928, with 52 members, he took over the Ministry of Transport and contributed significantly. In the Demertzis Government of 1936, when King George II returned to the throne, Metaxas became in charge of the Military Department and as Vice President received the mandate to form government under the Constitution when Demertzis died unexpectedly. 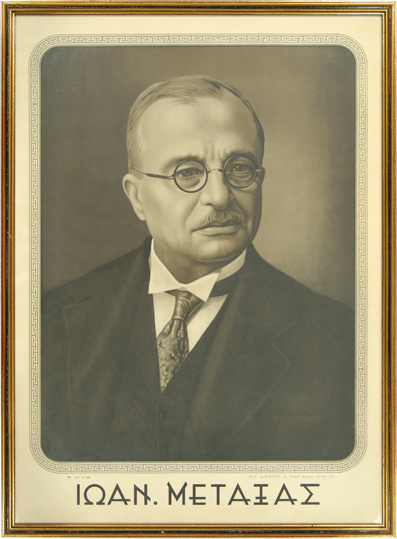 On 13 April 1936 Ioannis Metaxas received in Parliament 240 votes in favor, 16 against and 4 white. The Parliament came to a Constitutional close because of the summer. A planned general strike on 5 August was the reason for his request on 4 August by King George of the removal of certain articles of the Constitution. He dissolved the parliament and established a dictatorship based on Law 4229/1929, concerning a state emergency. The regime of 4 August gave Ioannis Metaxas the opportunity to prepare over 4 years for Greece to face the upcoming war, which from the beginning of 1936 was visible across Europe. The unity of the people along with the military preparation was the main target. Metaxas himself took over the Ministry of Foreign Affairs, Military, Navy, Air Force, as well as the Ministry of Education after 1938. He took steps to alleviate workers and farmers, socially and financially (setting 6 working days; the 8 hours shift; and the Sunday holiday). He created the IKA (Social Insurance Institute) clinics throughout the country, the first aid station, the House of Labor, the Students League, the OESB (Publishing Organization of School Books), the Civil Code, the Radio, the Fire Department, he defined the coastal zone, and gave names to the first National Parks. He promoted irrigation projects, created refugee housing, bridges, roads, expanded the rail network, improved the telephone communications, etc. For the youth he created EON (National Youth Organization), and the "Youth" magazine in order to educate, inform and prepare people for war. For the first time Greece had sufficient wheat and budget surplus. He also supported commercial exports, the arts, letters and the theater. During the Metaxas government 1,600 dissidents were imprisoned or exiled in islands without any of them losing their life. The usual way to deal with the communists was to make them sign a document whereby to renounce communism. 25,000 people were recoded to signed such a document. Similarly Eleftherios Venizelos had previously banished communists twice and went as far as to order death sentences. In foreign affairs Metaxas took a neutral stance as an ally of the British, he improved alliances with Turkey and the Balkans and took the decision to defend against the Axis on 18 March 1939 (see Metaxas' Diary). Greece became the only country in Europe - except England - that resisted. He secretly built the defensive "Metaxas Line" stretching to a length of 200 km in the Greco-Bulgarian border, 21 forts (Roupel, Istimbei etc.) and armed Greece. On 28 October 1940 at 3:00 in the morning he rejected the ultimatum of Italian ambassador Emmanuelle Gratsi seeking to occupy Greek territory at strategic locations and signed the first declaration of war against fascist Italy. The defense of Greece lasted 5 months and the victorious army repelled the Italian troops occupying large parts of Northern Epirus (southern Albania). Metaxas died in Athens on 29 January 1941 by inflammation of the pharynx, which eventually caused toxinaemic effects and complications. He was honored with widespread pandemic grief that is still acknowledged even today. He was succeeded by the Health Minister Alexander Koryzis. The existing literature on Ioannis Metaxas is poor and contradictory. The diary of Metaxas, which in 3,000 pages covers 45 years of action, was published in 1952-1962. It is currently available by Govostis. Moreover, the book entitled The National Disunion includes his articles in the "Kathimerini" newspaper of 1934. Some dislike him for his dictatorial power, while others admire him for his stability, his social and financial work, and his military victory against Italy. The dictatorship of Ioannis Metaxas and his personality has suffered a misconceived critique in several of its aspects mainly by historians who have not studied his biography in its entirety and the 1936-1941 period in relation to the background of European history and the Second World War. It has similarly been distorted by historians whose political orientation does not allow them to accept the facts they are aware of. Moreover the history of Metaxas has been been further damaged by the completely different situation created by the military junta, the seven-year dictatorship of 1967-1974. In spite of this, a large proportion of the Greek people respect his memory for his social work and the preparation of Greece for war. Nowadays there is a tendency, though timid, for literature to restore the truth about Ioannis Metaxas who, in fact was opposed to dictatorships as regimes and especially in the involvement of the army to enforce them. That was why he was the main driving force in suppressing the movements of Plastiras in 1933 and of the Navy officers in 1935. Opposing the nationalist 'Megáli Idéa' (Great Idea) and the Asia Minor Campaign, he was the promoter of the idea of a strong Greece with ecumenical dimension. In the interwar period he did everything in his capacity to unite the Greek people that were split between royalists and democrats, indigenous and refugees, rich and poor. Notwithstanding its educational role, the EON youth organization had this as its goal - "so that poor children do not differ from children of the rich" and to find their position in the group based on their merit, and have equal opportunities in life. For his social program he gave the known left union leader Aristeidis Dimitratos the position of Deputy Minister of Labor to implement socialist policies. Furthermore, characteristic is his democratic attitude towards the conservative and progressive trends in art. As a matter of fact his rare love for the visual arts led him to found the Panhellenic Exhibitions. It may sound odd, but his opponents did not forgive Metaxas for working hard for the nation to the best benefit of Greece. The present poster by Angelos Apergis represents a photograph of Ioannis Metaxas in his everyday suit. He never wore a military uniform after 1915 and his formal clothing at great ceremonies and receptions was with tailcoat and top hat. It is known from photographs that - despite being a military figure - Metaxas always wore civilian clothes, not very carefully kept and always greeted people by taking off his hat. Here he is set against a dark background, while light illuminates his gentle face, which is characterized by his straightforward, calm and decisive gaze, his narrow but rich mustache and his round spectacles. Finally, it is worth noting the characteristic pattern of continuous meander surrounding the picture, and the austere font Apergis used to display the sitter's name. The year in which Apergis released this poster is not known, but it may be during the Metaxas government. It was a custom of the time to publish posters with portraits and images from the battles with which to decorate shops, cafes, homes and public services since the time of the Balkan Wars. Even today, some houses are hung with posters portraying Metaxas.